At 6, Caitlin Brown(*) is big for her age, loves sweets, and has trouble buttoning her size-eight clothing–all of which worry her mother, Marci. “I was such a skinny kid at her age, and I’m terrified that she’s inherited my husband’s weight problem,” says the 40-year-old mother of two from Montclair, NJ. “I don’t want her to grow up fat.” We’re a nation obsessed with weight–our own and our children’s. It’s understandable: More than twice as many children are overweight today than were 25 years ago, some 13 percent of girls and 15 percent of boys, ages 6 to 11, according to a 1997 government study of more than 7,000 children. What’s more, overweight children are twice as likely to become overweight adults as those who are thin. It’s not easy to tell–in fact, even doctors may have a tough time deciding when a child is too heavy. Children’s bodies are constantly changing, and a little extra fat on the belly or thighs may occur a few months before a growth spurt, says Rodriguez. After the first year of life, most children gradually become thinner until they reach their leanest point around age 5 or 6. Then they put on more fat as their bodies prepare for the sexual development that occurs with adolescence. During the two or three years of puberty, a child’s weight typically doubles, while height increases by only 2.5 percent. By the same token, there are cases where a child’s pudginess isn’t just baby fat but an indicator of a weight problem that will persist throughout adulthood. While doctors can’t agree on a single standard for which is which, most rely on a weight-height ratio called the body mass index (see “When to Worry”). 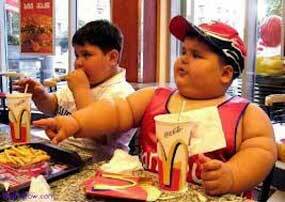 Children who score above the ninety-fifth percentile are considered overweight. Another risk factor is parents’ weight: Children under age 10 who have a weight problem and who have at least one overweight parent have a 60 percent chance of being overweight as adults, more than double the risk of their peers who have thin parents, according to a study conducted by Robert Whitaker, M.D., an assistant professor of pediatrics at the Children’s Hospital Medical Center in Cincinnati. In Marci Brown’s case, a checkup with Caitlin’s pediatrician determined that at four feet three inches and 60 pounds, the little girl’s weight and height were in proportion. But because Caitlin’s father is overweight, the family’s pediatrician suggested trying to curb the child’s cravings for sweets. If you’re anxious about whether your child is gaining too much weight or you want to prevent future problems, follow this advice from leading childhood weight experts. Avoid the D word. First, remember that the vast majority of overweight children under 17 don’t need to be on diets and may actually be harmed by them. “If children don’t get enough calories, it may be harder for them to make muscle and grow as they should,” says Rodriguez. Always check with your pediatrician first if you’re concerned about your child’s weight. Unless your doctor advises you otherwise, don’t try to follow a formal diet plan. Instead, focus on developing healthful, low-fat eating habits, and take simple calorie-cutting steps such as packing homemade lunches instead of letting your child buy school-cafeteria meals, which are notoriously high in fat and calories. At dinnertime, try serving larger portions of vegetables and smaller portions of starchy or high-fat foods, such as pasta or cheese. Following those steps will generally cut between 200 and 300 calories a day, enough for your child to lose at least half a pound a week without risk. Make fitness fun. Children should get between 30 minutes and an hour of activity at least five days a week, according to pediatricians and fitness professionals. Consider enrolling her in an organized sport such as swimming, soccer, or gymnastics–but make sure it’s something she enjoys. “Exercise shouldn’t be a punishment for overeating,” says Richard B. Parr, Ed.D., a professor of exercise physiology at Central Michigan University in Mount Pleasant. If you find you still can’t get your little couch potato moving, become her fitness partner: Walk to the playground after dinner, or take the family for a hike at a local park on the weekends. Limit TV. Children who spend more than four hours a day in front of the television are more likely to be overweight than those who watch programs for fewer than two hours a day, according to a recent study. And remember: Computer games and Web surfing don’t count as exercise either. Give hugs, not cookies. Using a bowl of ice cream or a piece of cake to soothe your child’s frustrations or disappointments teaches him to use food for comfort. Remember that a hug and kiss and a few soothing words usually will make the pain go away. Also avoid using treats as a bribe to get your child to put away toys or as a reward for eating carrots and broccoli. Sign yourself up. Don’t expect your child to develop healthful eating and exercise habits if you don’t practice them yourself. Serve the whole family low-fat food. “You can’t expect one child to eat an apple while you and the rest of the family are munching on chips,” says Marc S. Jacobson, M.D., director of the child and adolescent center for atherosclerosis at Schneider Children’s Hospital in New Hyde Park, NY. Don’t forbid foods. As any dieter knows, the surest way to become obsessed with a food is to make it off-limits. However, some restrictions are important–one cookie instead of two at lunch, or ice cream after dinner every other day instead of every day. Also, try trade-offs: Instead of forcing your child to skip the birthday cake at a friend’s party, tell him that the cake will replace that evening’s dessert. (*) The names of Caitlin and her mother have been changed to protect their privacy. To determine whether a child is too heavy, doctors start by figuring the child’s body mass index (BMI), a weight-height ratio. Children whose BMI falls between the eighty-fifth and ninety-fifth percentiles would benefit from more healthful eating and exercise habits. Those whose BMI is greater than 95 percent of kids their age (ninety-fifth percentile) are considered overweight and should consult a pediatrician or dietitian about developing a regimented eating plan. The American Dietetic Association can refer you to a registered dietitian; call 800-366-1655 and ask for someone who specializes in pediatric weight loss. * Multiply weight in pounds by 703. * Determine height in inches. * Square that number (multiply it by itself). * Divide weight by height. My son used to be overweight but as soon as I learned about it, I kept an eye on his eating habits. I know very well that when he grows up, he will blame me for making him fat. So as early as now, I am teaching him how weight affects one’s confidence. I never thought fat kids are cute. Most of us in the family have normal weight and although I am assured that my children will not get any fatter, I still want them to be responsible in eating. I also want them to be physically active. I thought it was cute to have a fat kid child. But after learning that one of our neighbors is suffering from diabetes at a very young age, I promised to myself that I will watch over my children’s diet.